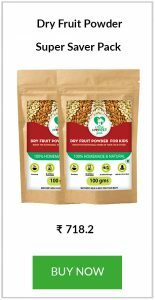 I started my search for How to make dry fruits powder for babies and toddlers months ago, tried a few but wasn’t satisfied with the results. I tried a lot of combinations but they were not so tasty, this one turned out to be so perfect with a dash of nutmeg. 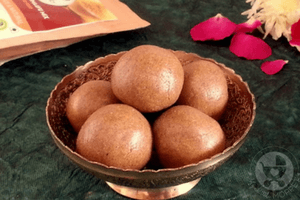 How to make Dry Fruits Powder For babies? 1. Dry Roast Badam, Pista and cashews. 2. In a pan heat the saffron strands till their colour turns little darker and switch off the gas. 3. 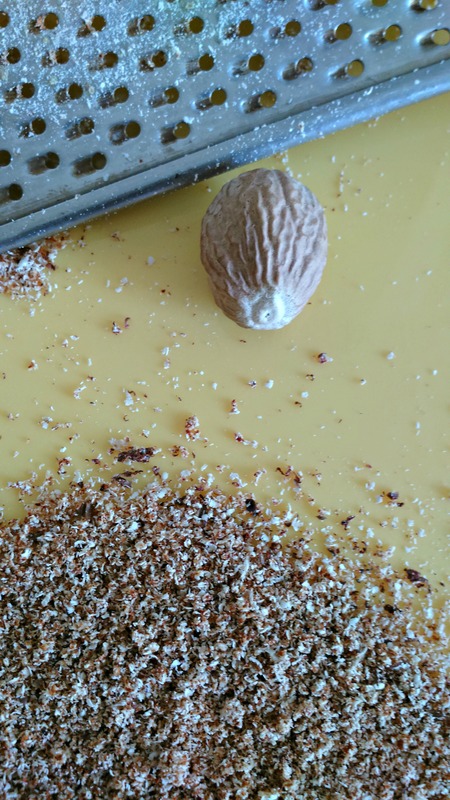 Grate the nutmeg into powder. 4. Powder all the roasted ingredients together in a mixie. Add the nutmeg powder and turmeric at the last and give a spin. 5. Take care not to grind for a long time as the dry fruits will leave oil. 6. Don’t expect a very dry powder.The powder will be little sticky to oily nature of the nuts. 7. Store them in a airtight container in the fridge.They can be stored for about 1 month. How to use the Dry Fruits Powder? 1. 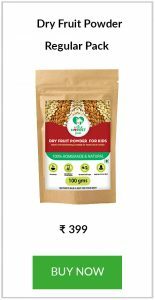 Dry Fruits Powder can be given to babies above 8 months. 2. Please follow the 3 day rule, add a 1/4 teaspoon of the dry fruits powder to porridge then next day too same amount and then increase it to half teaspoon of powder. 3. 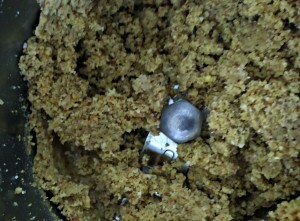 The Dry Fruits Powder Can be added to Porridges, pancakes, Rotis, desserts. It can be given to older kids with milk. It serves as a good energy drink. 2 or 3 teaspoon of the powder can be mixed in hot or chilled milk for kids. Update: We have also put together a video so you can see the step-by-step process in action! Acts as an good antioxidant. It is an effective cough and cold remedy. It acts as a powerful anti-inflammatory agent. This dry fruits powder is one of the best healthy weight gaining food for babies. 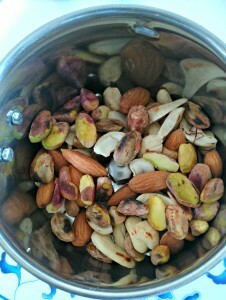 Dry Roast Badam, Pista and cashews. In a pan heat the saffron strands till their colour turns little darker and switch off the gas. 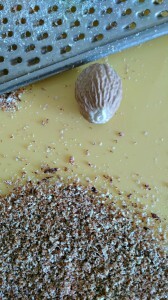 Grate the nutmeg into powder. Powder all the roasted ingredients together in a mixie. Add the nutmeg powder and turmeric at the last and give a spin. Take care not to grind for a long time as the dry fruits will leave oil. Don't expect a very dry powder.The powder will be little sticky to oily nature of the nuts. Store them in an airtight container in the fridge.They can be stored for about 1 month. Do not grind to get a finer powder as it will become a fine paste the !! It can be stored in the refrigerator for 1 month. It can be given at 8 months dear. Can I mix it up with rice and dal and feed my kids at lunch time? yes dear, you can mix with dal, dosa, roti dough, smoothies etc. Before roasting the almonds do we need to wash dem? No dear, dry roasting well is enough. Can I give it to my 10 month baby in summer. Yes dear, It can be given during summer too. Can we add cocoa powder to it to make a chocolate flavour. If yes, which brand powder will be good? It is better if you can take it as it is, but Yes you can add chocolate powder in it. If you wish to get chocolate flavor, please opt for organic product. Can I make this powder with just badam, cashew, elaichi and nutmeg? Yes you can. But other ingredients like pista and turmeric is equally good for babies. Hi ma’am is that okay if I don’t add saffron. Yes, it is alright if you do not want to add Saffron in the Dry Fruits Powder. How much quantity should be given to a 18months old? It’s written 2 tp per serving,so I should give 4 tp per day to my little one. Is it too much per day or it’s fine to give. I buy mixed nuts powder from ur site. Start with 2 tsp with milk in the morning and slowly introduce 2 tsp in evening milk. Dry fruit powder can also be used in baby food recipes. Can i add peanut and chironji in powder? Yes dear, both can be added while making dry fruits powder. Thank you so much for this healthy recipie. My 11 month old lo loved this with ragi porridge. Keep encouraging & supporting the new mom’s like me. Am following ur recipies for my lo. Once again thank you so much. Hi dr, can I add few cardamoms as well? Or nutmegs will do? You can add few cardamoms dear but do not add Nutmeg in extra quantity. Since nutmeg causes children to sleep. If given in excess it may lead to drastic measures. As per the given ingredients and quantity the dry fruits powder needs to be prepared. After refrigerating the powder?How do you use it? You mix it with milk immediately after taking out,or should we allow to come to room temperature before mixing to hot milk? This has been my confusion for all refrigerated baby food. Not necessary dear, you can just add the mix directly to a small amount of boiled milk, stir well and then mix it with the rest of the milk. Why dry fruits should be dry roasted before making powder. Why can’t we powder raw one. It’s dry roasted to reduce the natural moisture. If not it will become paste. Yes, You can add but please give little,check for allergies and also follow 3 day rule if introducing for the first time. You can start from 8 months dear. While introducing feed little, check for allergies and then continue. It can be given in summer too, if the baby is 6 months. Can add some pepper and palm sugar(Panam karkandu) to this dry fruits while prepare.. kindly reply..
Sugar can be added while serving the dry fruits powder if you like. Sure you can minimally add pepper, as it will help the little one. Hi .. liked the recipe.. but pista would have salt. So is it fine to add the mixture in formula milk. Yes it is fine. Ensure they are not the salted ones but plain. hii. thank you for helping in making indian receipes for babies.my 1 year old baby girl refuses to drink milk and receipes containg milk.like kheer , shake etc.she only breast feed. she eat other receipes but avoid milk and now banana also.what to do? i want to stop breast feed now bcz i am working. My baby is 8 months old can give dry fruit powder in formula milk. Yes, you can start. However please ensure that all these dry fruits are separately given to the baby and the baby is not allergic to any of these. Always start with small quantity. 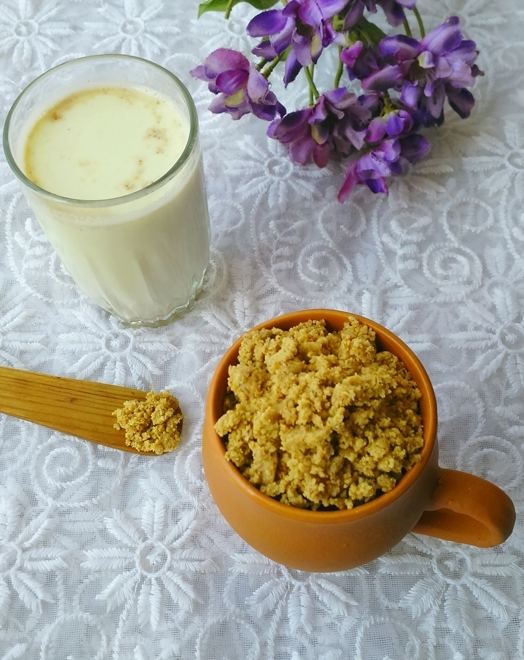 Yes you can give Ashwathy by mixing with milk or other recipes. You can add Walnuts however if you have already introduced it to the baby, or first follow a 3 day rule to determine that baby is not allergic to Walnuts. Can this powder be given in summers??? As my in laws are gvn a no no reaction. I’ll Dr.Hema .Thank you for your recipes.should we add this dry fruits powder last in the wheat porridge?also since my daughter is 10 month old and have no teeth will it choke? Hi, I am glad you like our recipes. No if it is given in powdered form it should not trouble the baby in any way. You can give it in any form dear. Even sprinkling over food is fine. Thank you for sharing this healthy recipe. I have doubt. This mixture when mixed along with warm milk doesn’t dissolve as it requires filtration of the milk. 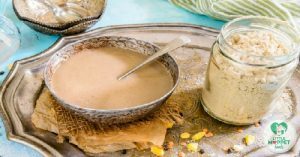 Can I prepare this mixture in paste consistency and store in refrigerator so that it can be easily dissolved and consumed. 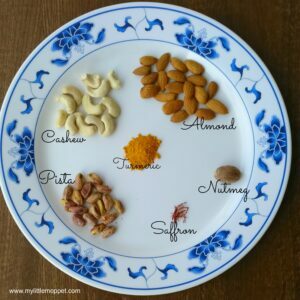 I would like to give dry fruit paste to my 13 month old son for memory and brain development, but I heard that roasting the nuts destroys the nutrients. How do I make paste with just soaked, unroasted nuts and how long can this be stored? Also his weight is normal, so I don’t want to add anything that will make him gain extra weight. from past 1 week I am waiting for your reply. doc if u reply me it ill be useful for me to either start the dry fruit powder or any other health drink powder. waiting for ur response . my baby is 9 month old , I am feeding her formula milk can I use this dry fruit powder with it? If no pls suggest me what type of energetic pow or health powder can I give her? I made dry fruit powder and gave half spoon to my 9 month old baby. He passes red stool for past two days, though not always. Will the dry fruit powder be reason for this. Please reply me as I am confused. Apart from that he did not eat anything new. Was the stools entirely red or there were red spots? I got a doubt. I made this nuts powder today. After mixing with milk, should it need to be filtered? Bcas my lo can feel the nuts granule and not drinking it… Will filtering removes the nutritions in it..? Is there any other way to do it…? Can I add peanuts and walnuts with other dry fruits? If yes, should I grind everything at the same time? Your recipes are really useful. Just wanted to know if this dry fruit powder can be added to formula milk for 8 months old and above. If yes then how and approx. Proportion of powder to milk. Thanks. mam kya hum ise summers me bhi de sakte h kya… kyonki sb bolte h ki summers me dry fruits nahi dene chaiye. Ur website is really interesting . And it’s very informative for moms like me . hi.. my daughter is 6.5 months old.. can I give this dry fruit powder to her by adding in her food ? Hi.. My daughter is 6.5 months old.can I add this nut powder in her porridge? 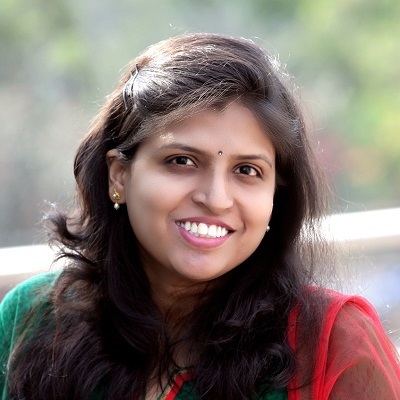 Hi hema all your recipes are good and very helpful to moms.But my 1 and half year princess is not eating food at all but she likes to drink milk how to get rid off this…. Hi.. Thanks for the useful recipe. My baby is 15 months old.. As I boil milk with this powder, it looks like lumps in the milk.. Should I seive it or once again grind it along with the milk? Or will she get cough with this? Can I give her this at bed time? Should I add dry dates in this powder..? Roast it or add as it is..? Want to try it for my little one…. Will I add dry dates..? Should I roast it…? Or add it as it is..? Thanks for all d baby food recipes. Really you are doing a great job for all new moms. My daughter is 9 month old and her wait is 7 kg now, her birth weight was 2.6 kg. As per doctor it is lower side but my baby is very active. I am already giving her sprouts sathu maavu powder which i prepared at home by using recipe. please give me some suggestions for increasing her weight. Can you give a food chart for with quantity also. please help me . I am really worried for her weight. your recipe is interesting my daughter is 13months old how many spoon add in the milk??? and I can add this powder in boiling milk or add this powder after milk warmed??? can i add this with formula? my 12 months baby don’t like to drink milk. next month her first b’day but not yet she get teeth. what can i do? I got through all comments Really superb. Can you help me in this line? 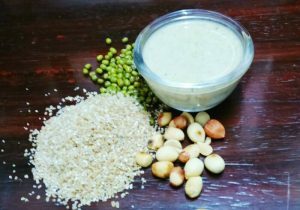 I want to manufacture this baby foods in large scale for marketing in Tamilnadu.I have one cashew processing unit of my own.So want to establish one sister convern for making baby food How can i do this?What are the legal proceedurs? Nice recipes. Should the dry fruits be washed n dried before roasting.. similar to sathu maavu powder ? Hi Dr. My son is 9.5 month Can I feed dry fruit powder with porridge every day. Hey hi Hema, I made the dry fruit powder but I forgot to dry roast almonds cashew n pista.is it okay?? My 1 year old son has diarreoha . He is on antibiotics as he has infection and fever. His stool cycle is still not settled and is at times getting fever as well.Currently I am giving him mashed boiled apples, apple juice, nestum rice, electrol apple and orange flavour, pomogranate juice, moong dal and rice kichdi. Can you please suggest what else can be given to him in terms of solids. Also the dochas asked to start diluted nan pro in smaller quantity. Hii mam…can we add mishri to this mix and daalchini too? thanks for all ur recipes. They help a lot. also can raisins , an jeer, dates be given to babies . Baby is 8 months. How would we give this ? Great to hear that the recipes are helpful. My baby s 13 months old. I breastfeed her during night. She does not take cow milk at all. I am thinking to try this with milk. Also can u please suggest whether I can add date syrup with milk? How do I make it? Thanks in advance! Thank you so much for this recipe! My toddler is 20 months old and is not underweight. Is it ok to give 1 spoon with milk daily or will he become overweight? I am following your dry fruit powder recipe since 2-3 months for my 13 month old son. I have added walnut , dry date in above recipe.No added turmeric powder. I am adding 1 tsp to his 500ml milk in the morning and boil it for some time. I have to sieve this milk as powder is not so fine and he tries to omit if get particles of powder in milk. I am using this boiled milk for complete day. Is this a correct way to use .. I can not add this in porridge as he don’t swallow it. Also if I am giving it only through the milk then how much should be quantity?? If adding turmeric will help?? as many times he suffers from cough. 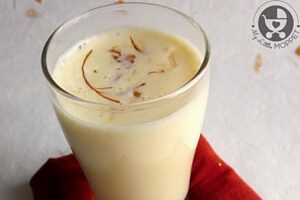 Please don not boil milk with dry fruits powder, you can add after the milk is warmed, and you should always give the baby only freshly prepared milk , you can give daily 1 teaspoon of this dry fruits powder to milk. I found this recipe when am searching for home made dry fruit powder and found quiet useful. Yes you can all of them except the chia seeds I guess. Figs will be difficult to powder as they will be a little sticky. May I know how did u powder walnuts and dates? Have u used walnuts with or without shell? Can i use dried apricots wit it…. nd hw? How do I make dates puree? How long can I store it? I tried this receipe and got a very sticky oily powder. Is it safe to use by storing in refrigerator? Can i use it with my regular porridge powder even if it is sticky? Hi..thanx for such a nice recipe..my son is 9.5 months old..he used to eat all food earlier but since he turned 9 months he is not eating properly..he is not interested in milk too..how much teaspoon dry fruit powder should I add in milk..hope so he has milk after adding this dry fruit powder..thanx in advance..
Hi Kopal, it is normal for toddlers to have phases of fussy eating, you’ll just have to deal with it till it passes.  Here are some tips: http://www.mylittlemoppet.com/how-to-feed-your-fussy-toddler/. 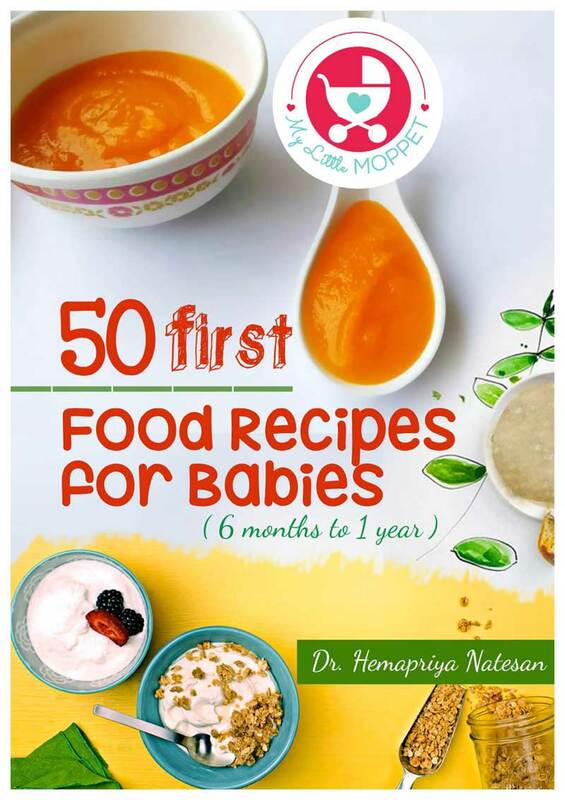 For a list of weight gaining foods, check this out: http://www.mylittlemoppet.com/20-super-healthy-weight-gain-foods-babies-kids/. Stopping breastfeeding is not easy, and can take longer in some babies than others. Go very gradually, by cutting out one feed at a time, preferably starting with the ones during the day, when she is busy playing and will miss it the least. Leave the night feed for the last. I loved this recipe. I wanted to check if the dry fruit powder can be added to formula milk for 11 month old. Is it ideal to feed him this powder without soaking the dry fruits? Because they can harm in summer weather. N more so, if not what other dry can i add? is going on..And also I am interested in finding your more recipe..can you display your website pls.. There are few queries..heard babies develop allergies with nuts..so how can i figure out that baby has developed allergy with the dry fruit powder and thus should stop?Also how should i store and how long can it be kept?I have not kept this mixture prepared 5 days before, in refrigerator so is it spoiled now? Thanks for this useful information. My daughter is 10 months old. Previously she use to eat everything but now from sometime she refuse to take anything except breastmilk. She is just 7 kgs. Though she is an active baby, I am worried about her growth. Can I offer her this dryfruit mix as raw, I mean without mixing it with something else? Can I give it to her in summers too as I doubt it may be warm for my lil ones tummy? Does this mixture contains any ingredient which might be allergic in any way? Please assist me. Thanks. 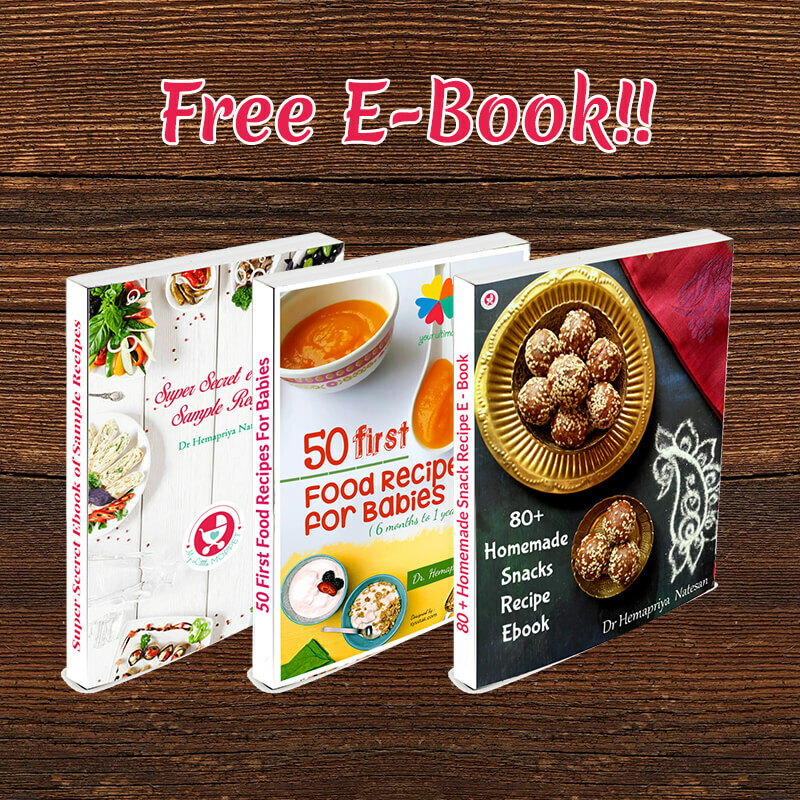 Great recipes and awesome tips… My daughter just completed seven months. Can I substitute nutmeg with cinnamon powder? Also which other dry fruits can be added to this mix. Many thanks!! My daughter are 1half yrs old and she is not eating anything but she like to drink milk and water in this summer days. Previously she eat everything dal, rice, roti etc. But now she don’t like to eat this so I m little bit worried about this . Plz tell me what I do?? Can I add walnuts also j this powder?? 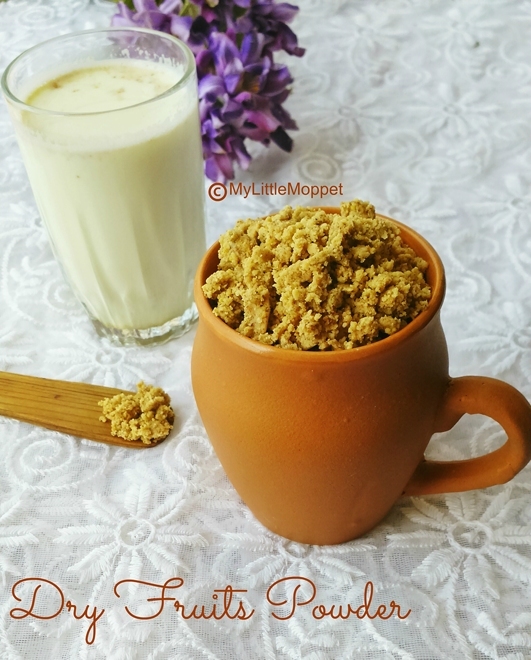 good recipies ya… being a doctor mommy managing your baby’s diet with a hectic baby schedule can be really tasking…most of your recipies are easy to make and quick too..
ur dry fruit powder recipie is too good. its the best for mothers who plan travelling. i usually soak almonds, cashewnuts, walnut anjeer dry date and pista with black raisins over night and cut them into pieces. i use it to make sheera and then blend it with milk and ripe bannana..
thank fully my son loves it..
how do you think this recipie is nutritionally? do you think i should make any changes in it? plz lemme know. Hi Sheetal, Yes, your recipe is also equally nutritious, How old is your son? Wonderful recipe, Hema. Can I give the above mixture without Nutmeg (Not sure if I’ll get it in US). Also can I give it along with milk at bedtime. Will it become too heavy and gassy for the toddler? Right now I give Badam and Turmeric mixed with milk before bedtime. Also can this be given daily? Can this b added to roti dough to makephulkas,upma, dalia, rice pancakes, my 18 month old doesn’t like anything sweet hence everything is sweet and salted. Is it OK? Do we have to use unsalted pista ? You are doing a gr8 job, thanks for the help! I want to know if this dry fruit powder can be given during summers too?? Hello madam my son is 5 months 4 days old.. Can I give dry fruits powder or not? I tried this one and it came out very well.thank u so much. Thank u so much :)..
Can we add walnuts for a 10 month baby along with this mix? My son is 2yrs old shal I add haselnuts to it. Found your dry fruit powder recipe very interesting. Will try it soon. My daughter is 18 months old & I give her a dry fruit paste daily along with banana & milk. I feel it a great way to kick start her active busy day. For the paste I overnight soak 2 almonds & 2 cashews. Just before servicing this to my baby I wash all ingredients. Hand pound 1 dry fig, add the over night soaked almonds (skin removed) & cashews. Add 2 walnuts & 1 wet date (skin removed) last. Add 1 elachi banana & lightly warmed milk. Please advise if this is recommended & add suggestions for improvement please. Hey can i add walnuts too.. Heard its good fr brain development.. Also is it ok if i dont roast d nuts n grind them straight away.. I would like to thank you for all the information provided here. here i have question about the above recipe. 1. what is the ideal time for this food? 2. what is the ideal quantity? 3. Can this be replaced with meal in times? my baby is 1 year 2 mons old. May I use sunflower seed among with the other ingredients ? Hi Biswas , How old is your baby? Healthy mix for kids!! thanks for sharing. Can we prepare it without nutmeg? Yes you can prepare without nutmeg too. Very Interesting… Pls suggest how we can repost on our website. You can share this link in your website.